TSE 809: Sales From The Street-"My Creative Lazy Ideas"
Sometimes the sales basics feel mundane. Sometimes we burn ourselves out making phone calls and sending emails, and we feel like we’re spinning our wheels. Without regard for how effective it is, we want to try something different. 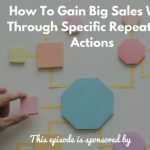 On today’s episode of Sales From The Street, I share my own experience with burnout and the hard lessons I learned from it. I was looking for an easy way out and avoiding the things I knew I needed to do. In college, I worked in an IT training company that offered training classes. I was tired of making phone calls and sending emails and I wanted to try something new like guerrilla marketing. I assumed the marketing department was the problem, and I figured there was a better way to get our company name out there. After doing lots of research, I launched ideas for computers at bus stations, as well as A-frame signs and banners; and I got very few leads. It turns out the problem wasn’t the phone calls themselves. The problem was that my phone calls weren’t effective. I didn’t speak the language of the decision-makers I was contacting. I didn’t understand my ideal customer, and I didn’t know how to differentiate. When I finally sat down with the technicians to understand what the clients liked about the training and the problems they were trying to solve, I had a better understanding. I would never suggest that you shouldn’t try new things. Do research in your off-time to discover what others in your industry are doing. Put your own spin on it and tweak it until you get it right. When you’re consistent at something and you improve and tweak it, you’ll see results. Make sure you budget your time effectively. Call your prospects when they are most likely to be available. I was calling home phone numbers in the middle of the day when most people were likely to be gone. Over time, I learned what worked and I gained decent clients and I acquired good experience. Try unique things that tie to your industry. Understand how to help your prospects and recognize them as humans. People often tell us to fail quickly and then move on, but what if we don’t have to fail at all? What if you could get a jumpstart by learning from other people’s challenges? Doesn’t it make sense to figure out where other people went wrong so you can avoid repeating their mistakes? 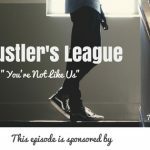 The Sales Evangelist Hustler’s League is a group coaching program that offers training sessions every week, and a chance to hear from sales professionals from other industries. We offer group accountability and an exchange of ideas. We’d love for you to check it out, and we’d be honored to have you join us. The April semester will focus on building value so you can see better results and close more deals. We’d also love for you to subscribe to the podcast, and if you haven’t already, leave us a review wherever you’re listening. Evangelize for us by telling other people about the podcast.